See photos of the most popular types of windows in North Carolina new homes, from casement to double-hung, transom, and picture. Browse the photos below for examples of casement, double-hung, transom, picture, triangle, trapezoid, arch, bay, and obscure windows. Casement windows can be hinged left or right, to open outwards (rather than sliding up and down). Casement windows open with a crank mechanism. 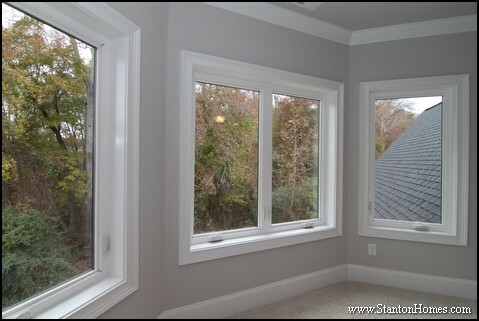 The dual casement windows in this master bedroom open left and right, to create wide openings to the spacious backyard. See a photo gallery of this home, a version of the Judson. 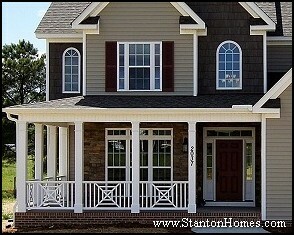 Many home plans include casement windows on either side of large window designs. In this home, note the single casement window on the right side of the room. Single-hung or 'standard' windows open in one direction: the bottom panel typically slides upwards. With double-hung windows, both glass panels open, sliding from the top and bottom. While casement windows swing outward, double-hung windows remain parallel to your home. 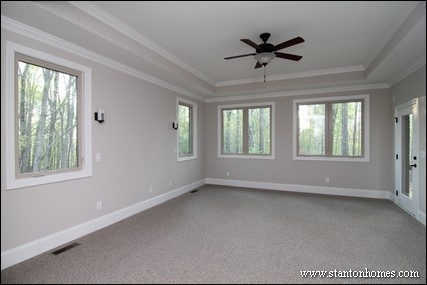 This master bedroom and sitting room uses double-hung windows (distinct by the small gap in the casing left open for the bottom panel to slide upwards). Transom windows are usually small, accent windows placed above a door or window to let more light in, or to add visual interest. Transoms may or may not operate (i.e. open to let air in). Picture windows are usually large, and always stationary. 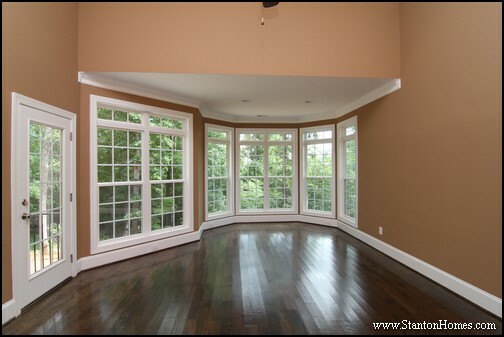 Picture windows are used most often in foyers, master bathrooms, and large great rooms. 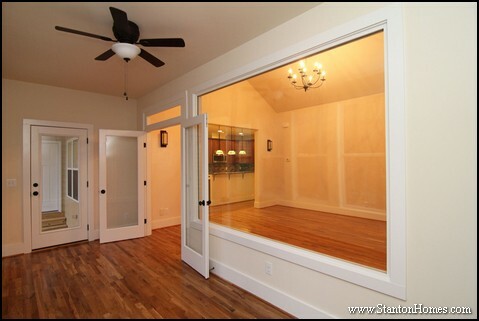 Transom windows line these great room picture windows. 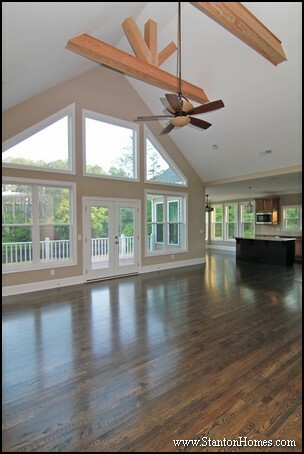 We're finding that interior picture windows are an emerging trend in North Carolina custom homes - especially for floor plans with a sunroom. Triangle windows are often used to make beautiful designs. 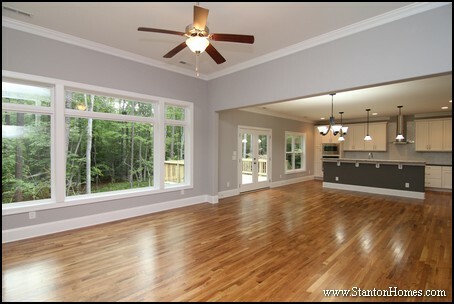 They can be accent windows in a great room, or stand-alone windows in creative spaces. Trapezoid windows make perfect pairs with these triangle windows - designed to follow the vaulted roofline in the two story great room. A contemporary ball light contrasts with the sharp angles in the window wall layout. 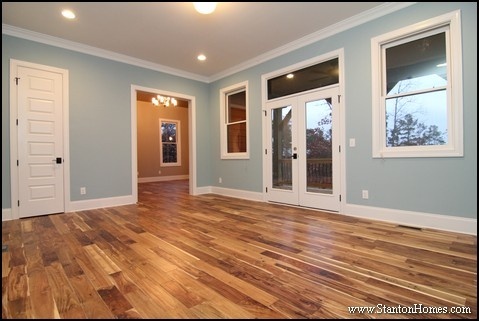 Maple floors keep the natural motif flowing throughout the home. Arch or radius windows have a curved or half-circle top and rectangular bottom. Arch and radius windows, similar to triangle windows, make great accent pieces - usually placed above "standard" rectangle windows. Alcoves or bays give you more interior space by extending a small area outwards. Bay windows usually fill alcove spaces, for plenty of natural and moon light. 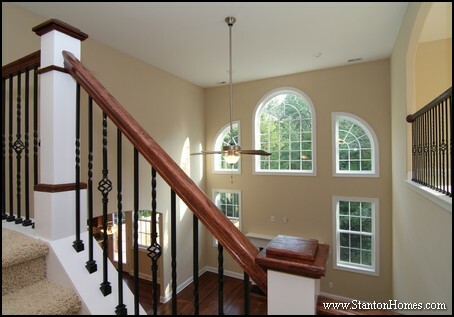 Obscure windows are most common in the foyer and master bathroom. They let light in, without allowing views in or out. The shape, texture, or color of a window can cause the obscuring effect. 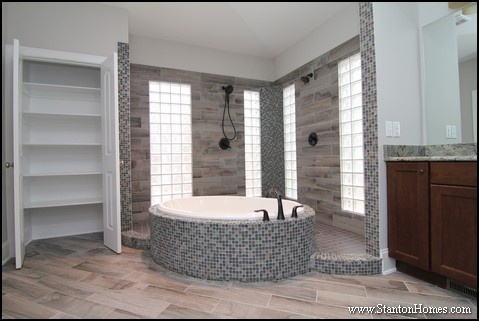 These glass blocks use a distinct pattern to obscure views into the master bathroom. Which window shapes, styles, or functions do you like best? Get more custom home window ideas on Houzz. 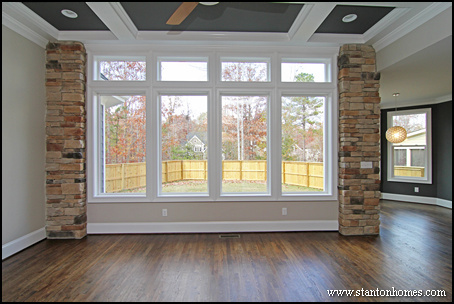 What are the Most Popular Window Types for New Custom Built Homes? 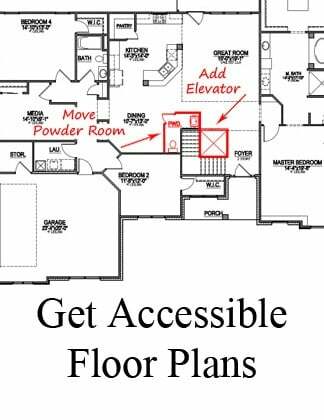 One reason homeowners choose to build custom is for the ability to determine every detail about the home, down to individual window size and style selections. Your window style adds to the character and asthetic appeal of your home, so you will want to consider all your options and choose carefully. 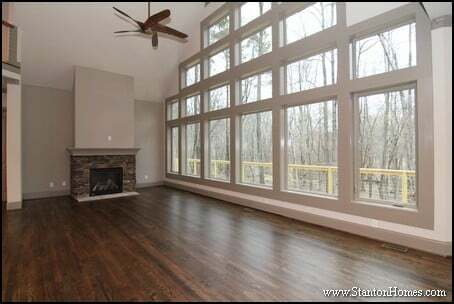 What are the most popular window selections for new custom homes in the Raleigh area? Below are some of the most popular window styles, one (or more) of which might be ideal for your next home. Half round windows are rounded from side to side, and look like a half-circle. Half round windows are often included above doors or other windows, allowing more light into the home. 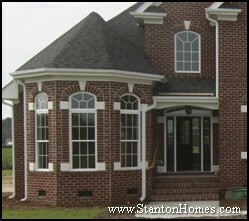 Pictured here are half round windows, with a hint of sunburst design. Arch windows can have a traditional or contemporary feel, depending on the style of the home. Arch windows are similar to half round windows, with an arched top between two straight sides. Arch windows are also often placed above doors or other windows, allowing more light into the home. Eyebrow windows are just that - shaped like an eyebrow! Eyebrow windows were originally used to bring light and ventilation into attic spaces, but can now be incorporated into any area of the home. Eyebrow window designs have long been used to enhance many different architectural styles, in conjunction with various window styles. Transom windows are stationary windows, often found above or to the sides of entry doors or other windows. Transom windows allow more light into the home, while adding complexity to the exterior. 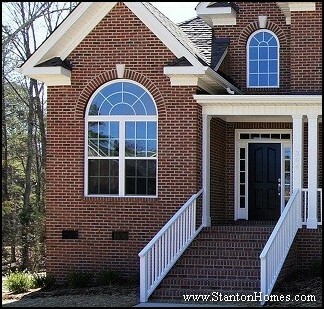 The transom windows pictured here add an elegant accent to this custom home by Stanton Homes. Windows with flankers consist of three pieces: a center window and a smaller window to each side. Windows with flankers come in a variety of sizes. The "flanking" windows can be of different heights. Sunburst windows consist of several window panes, divided into sun ray shapes. 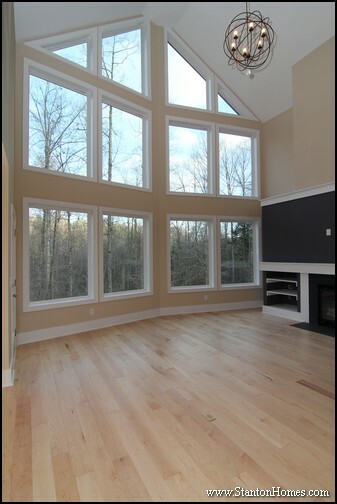 Sunburst windows can be complex, with many "rays" or more simple with just a few. Sunburst treatments are often used on half-round and colonial arch windows. 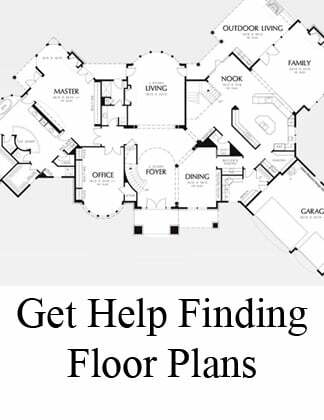 Want to read more about custom home design and trends? 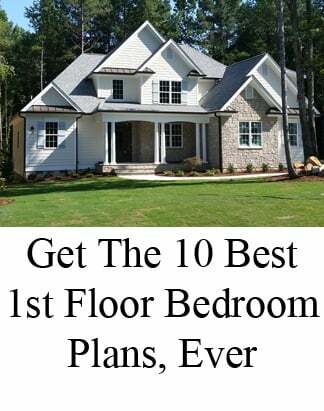 Why Buy a New Home? 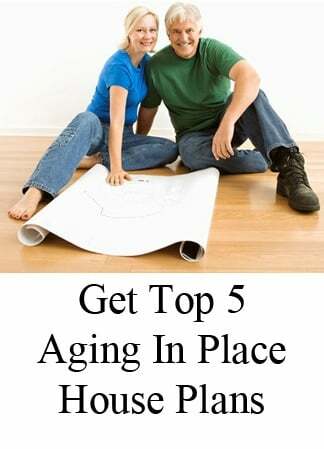 Top 10 Reasons Why Homebuyers Choose "New"